Seriously: is this a joke or what? Long sentences are necessarily bad? And what’s wrong with adverbs? They have been around in the English language for quite some time (another common fallacy is to prefer old versions to new!) so perhaps we should honour them instead of banning them, I’d say. The next two (no long words and no passive, please) come from George Orwell, but this doesn’t mean that we should accept them with no questions. One thing is certain: if you always insist on using (!) “use” instead of “utilize”, your writing will remain at an intermediate level. Actually, the creators of the page quite honestly (not another adverb!) state that your writing level should never exceed that of a 10th-grader – and this is exactly what you’ll achieve by following their advice. Have you ever heard the phrase “dumbing down”? I don’t even have to explain that the passive is no evil – Orwell himself used it just as frequently as any other writer. 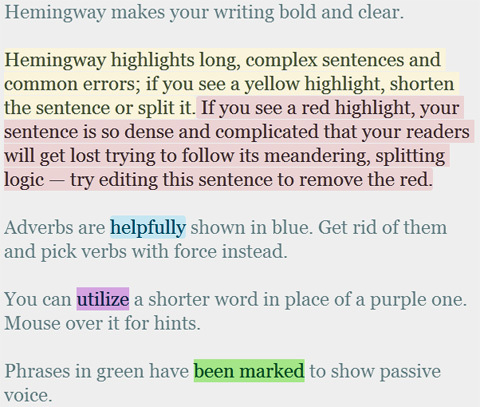 So did the author of these tips above – see the sentence “Adverbs are helpfully shown in blue” and, for the greatest irony: “Phrases in green have been marked in green”. Two out of four of your tips are in the passive, thank you very much. Why do they have the structure in English in the first place if we’re not supposed to use it? Good luck trying to write without it – you’ll sound quite unnatural. These last two “rules” have been widely criticised (passive! ); two recent articles I especially liked are here and here. Of course, any of these “rules” above can be true, and are obviously true if you overuse any of the devices they criticise – too many long sentences will most certainly make for difficult reading; using too many “long” words (whatever that means) might make your writing sound posh; the overuse of the passive will make your writing stale and impersonal. But banning them outright is as stupid as it gets. And I still don’t understand what’s wrong with the poor adverb.